from INFORSE-Europe: SustainableEnergy (VE), DIB, Nordic Folkecenter for Renewable Energy from Denmark; Center for Alternative Technology (CAT), UK. from: INFORSE-South Asia: INSEDA & WAFD India; IDEA, Sri Lanka; Grameen Shakti, Bangladesh. from: INFORSE-Africa: TaTEDO in Tanzania, Uganda Coalition for Sustainable Development (UCSD), ENDA Senegal. Stronger NDCs & LEDS that include local low emission solutions to increase energy access and improve livelihoods to reduce poverty. 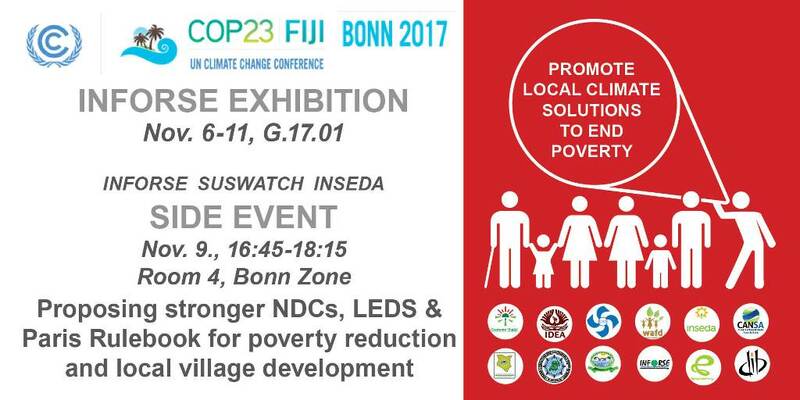 We will showcase village based solutions from South Asia and East Africa and how NDCs & LEDS can promote these solutions, how a good Paris Rulebook can facilitate this. Participants/Speakers including: Suswatch Kenya; TATEDO,Tanzania/INFORSE-East Africa; Uganda Coalition for Sustainable Development; INSEDA-INFORSE-South Asia; CRT/Nepal; Grameen Shakti,Bangladesh; IDEA,Sri Lanka, DIB and VE fra Denmark. The Side Event is organised by INFORSE together with the members from East Africa, South Asia, and Europe: INSEDA & WAFD, Grameen Shakti, IDEA, CRT-Nepal, DIB, VE/SE, TaTEDO, UCSD in cooperation with Suswatch and CAN-South Asia. See full proceedings: INFORSE at COP23. 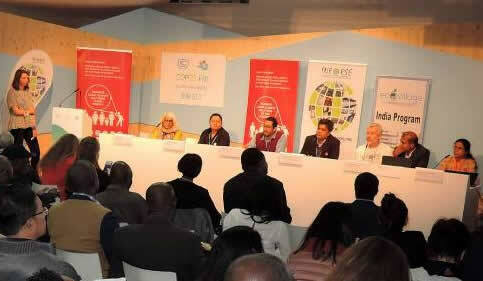 The organisers on the UNFCCC side event list are: INFORSE, INSEDA, & Suswatch Kenya. - INFORSE-South Asia and the NGO Advocacy EVD Project behind the Side Event at INFORSE-Asia.
. Official UNFCCC COP 23 side event list. - INFORSE at UNFCCC COP 16 in Cancun, Mexico, 2010. - INFORSE at UNFCCC COP 15 in Copenhagen, Denmark, 2009. - INFORSE's Position Paper on Climate Change (INFORSE's Position pdf file 99 kB) at the start of COP15, 7 December, 2009. The UNFCCC archive site of Side Events.